Like all animals, penguins too are part of the food chain, which means they have predators chasing and eating them. In these food chain, an animal only hunt and kill to satisfy its appetite and feed their young, not for fun. It is a natural selection, while only the weak and sick animals get caught. Predators can be divided in 2 large groups, either when they chase breeding penguins on land or adult and juveniles, swimming in the water. And there are some parasites like lice, mite and fleas which cause illness and infections. 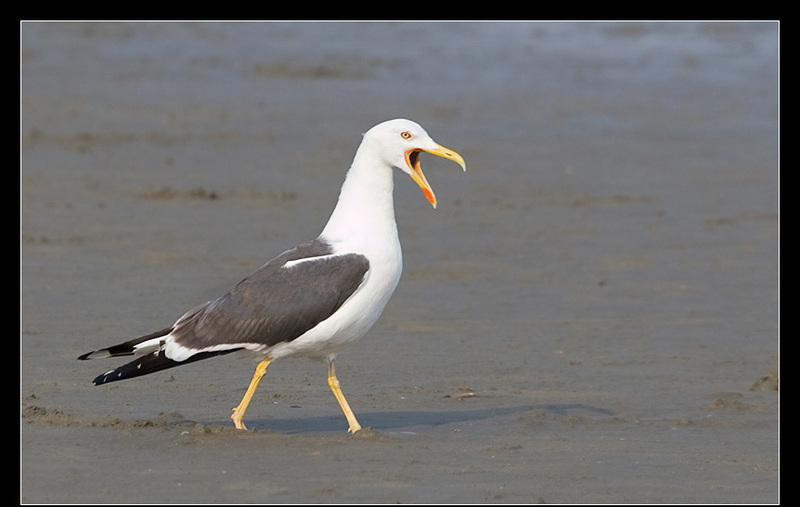 - All enemies who attack from above, like there are giant petrels, the Antarctic skuas or predatory gulls, sheathbills (Chionididae) and seagulls. - Land predators, like rats, mustelids, cats and dogs, unfortunately introduced by men. 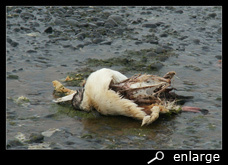 This includes all animals attacking penguins, their eggs and chicks, when they are ashore for breeding and moulting. Mostly these predators eliminate the weaker and sick birds, keeping the population healthy. 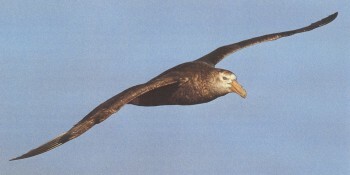 The petrel is a relative to the albatross. His characteristics are : 2 m wingspan, dark brown till white colours and a big, sharp bill, with which he catches his prey and tears the flesh to pieces. Like an albatross, he too can glide very elegant and almost weightless over the water. During the hunt they can fly hundreds of kilometres. Ashore they move rather clumsy and jump with their wings half open. They rarely hunt penguins out at sea. 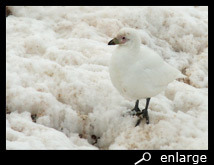 Only during high summer, when young adelie penguins for the first time go to sea, they are there too. While flying up and down along the shore, they isolate a chick and then fall with all their weight up on the young bird, breaking its neck through the force of the collision. Another (more cruel) tactic is to surround the young bird with more than one and pick at it till he dies. During the breeding season of penguins, giant petrels swarm around for hours, searching for sick or abandoned chicks or for wounded adult animals. An adult penguin normally can keep off this predator, but when already wounded by f.e. a leopard seal, he is too weak to repel an attack. The giant petrels then attack him from the rear and enlarge his wounds by bites, picking the intestines out. Luckily soon the penguin is so weak that he hardly feels something. Most of the time the giant petrel chooses the chicks as prey. Especially chicks of the king penguins are the victims. They are, only three months old, most of the time left alone during winter, while the adults are searching for food at sea. While those chicks rarely get food, they become so weak that they build an easy prey. Skuas look a lot like large, brown gulls and therefore are called predatory gulls. These birds of prey also have a predilection for eggs and chicken in all stages of development. 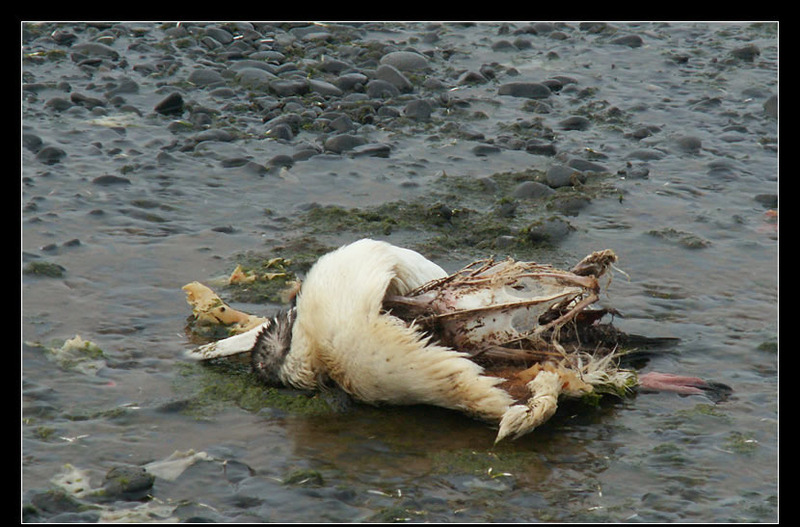 Sometimes, the wounded and sick adult penguins become victims of these skuas. Because the skuas are very feared predators, penguins directly attack with opened bills and stretched necks when they see one of them. Skuas use this to their advantage by attacking in pairs. The first one fly just out of reach around a breeding penguin, making him angry, and trying to get him away from the nest. When the penguin, in the end, is so annoyed that he follows the skua for a few steps, the other one steals the egg or chick out of the nest. Then the two skuas share their prey. Because for the greater part, skuas feed on eggs and chicks of the penguins, you can ask what they eat when it's no breeding season. They use a very special trick to become a warm meal. They fly over sea, looking for a poor seabird that just has eaten. That bird can not ascend fast, caused by the weight of his stomach, and isn't able to avoid the heavy attacks of the skuas. 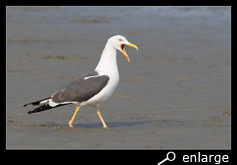 At the very last, the seabird will throw up and spit out his food, to escape from the attacks. The skua just waits for this and before the food can touch the surface of the water, the skua gets it. To us it sounds disgusting but for the skua it is a very welcome meal. Sheathbills are only in a restricted way a predator to penguins. They are as large as small chicken with many of their characteristics like fear of water and heights. 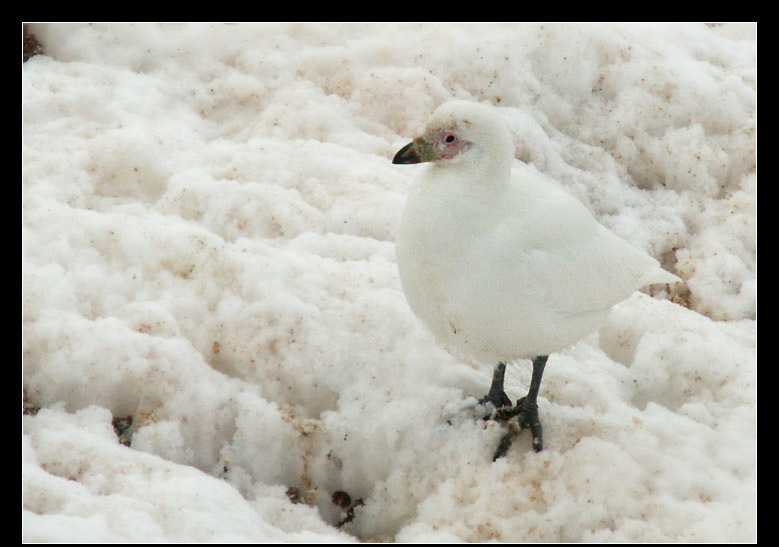 They have white feathers and a special bill, at the top black and at the start red-yellow folds of the skin. Mostly they feed on garbage and carrion. But sometimes they take a wounded penguin, which is too weak to defend itself. Abandoned eggs are part of their prey, but because they need a long time to pick a hole in an egg, they mostly are too slow and chased away in time. Their strength is to steal the food of a feeding penguin. They sneak close to a nest and wait till the adult penguin opens its bill to feed its chick. This chick stands directly under the throwing up parent, ready to catch the partly digested food out of the bill. On that moment the sheathbills flies up and lands almost direct on the head of the feeding penguin. The penguin is startled by this and stops the feeding. But his bill is still full of food, and he isn't able to swallow it down again, so the warm krill falls on the ground where the sheathbills can take it up. Although most of the time, sheathbills are the cleaning team in a penguin colony. Of course there are also a lot of seagulls near almost every penguin colony. Those are looking for abandoned eggs and chicks. For a scientist, on research in the colony, it can cause problems, because when a penguin gets frightened of him and leaves his nest for just a moment, it can be disastrous for the eggs or chicks. There is a long list of land-predators for penguins. Many of them are introduced by men, including rats, cats and dogs etc. Four penguin species breed on the mainland : namely the African, humboldt, magellannic and the fairy little penguins. These are threatened by many land-predators. So a leopard can be very dangerous for African penguins. And when an island, with a colony, was connected with the mainland by a bridge, this colony was teased by foxes, wild cats and even snakes. And magellannic penguins often lose their eggs and chicks to armadillos. The best known predators are the leopard seals, but there are also fur seals, and whales and sharks. To distract their predators and make the hunt more difficult, penguins usually enter in group in the water. The leopard seal is relative to true seals and belongs to the family of the phocide (earless) seals. These, in opposite to eared seals, can only propel themselves on land by wriggling on their bellies or pulling themselves forward with their front limbs. They are well adjusted to a life in the water with their short limbs. Characteristic for these seals is the lack of external ears, although they can hear very well. To the family of the southern seals also belong, beside the leopard seals, the crab eaters, the Ross and the Weddell seals. They all live in and around Antarctica. Leopard seals can reach a lenght of 4 m and weighs about 500 kg. They have a very large mouth, with the corners of their mouth reaching almost the back of their head. Their teeth consist of long, sharp incisors, large pointed eye-teeth and 3 pointed back teeth. In that way they are able to catch krill as well as fast swimming fishes and penguins. The belly of a leopard seal is light coloured and the back is dark and spotted, so they are almost invisible in the water. Eating a penguin by a leopard seal looks very cruel. The predator waits almost immobile where the penguins usually go ashore. As soon as a penguin comes too close, he grabs him with a fast move of his head and hold him very strongly between his jaws. Then he shakes his prey backwards and forwards with fast, abrupt movements till the skin of the penguin tears and he can bite parts of the flesh. A relative South African sea bear. 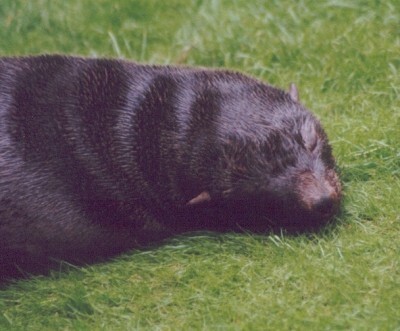 In opposite to leopard seals, fur seals belong to the eared seals (otariidae seals). They are relative to sea lions and sea bears. Because they are able to turn their hind flippers forward, they can use all four limbs when moving on land. They are about 2 m long and weigh between 125 and 200 kg. Because of their power of endurance, they can hunt a penguin for a long time and exhaust him so much that the bird needs to rest on the surface of the water, where he will be caught. 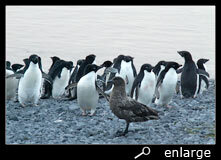 Sometimes fur seals too, wait like a leopard seal at the place where penguins usually come ashore and catch them there. Luckily not all of the fur seals are predators of a penguin. Killer whales (orcas) hunt for penguins, although these are only a small prey to an 8 m long orca. Killer whales are faster (40 km/hr) than penguins, but these are much more manoeuvrable. Therefore whales drive them inside of seaweed, where a penguin loses his advantage and gets trapped, where the heavy whale can catch him by breaking the weed with his body-mass. Sharks too are a threat to those penguin-species, which live in the same waters as the sharks. This counts especially for Galapagos, Humboldt, African, Magellannic and fairy little penguins. Although parasites are not a classical predator, they too can harm a penguin very much. They drink the blood of their prey and cause a lot of illness. Some penguins die through worms in their digestive tract. Most of the time, it are the weaker animals who suffer by it. 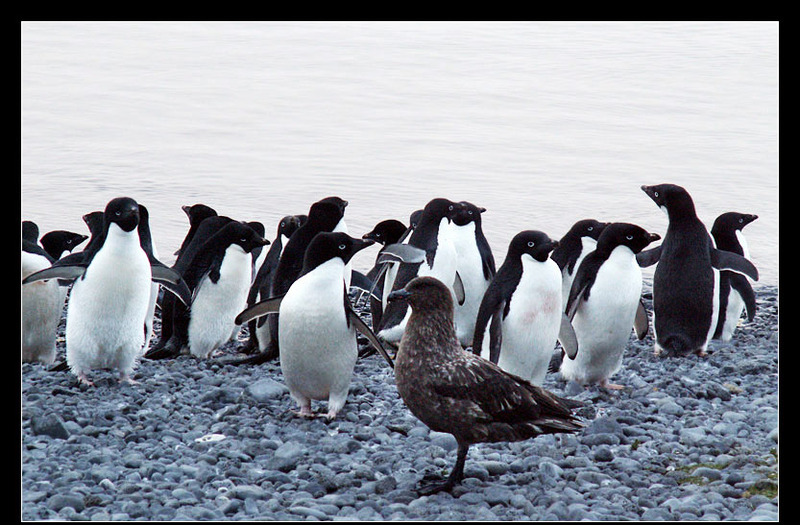 Especially in Peru and Chile ticks, lice and fleas can be a real plague for seabirds, including the penguins. When these ticks are also carrier of a virus, it can lead to sickness with high fever and several side effects. At last we must remark the bird malaria, transmitted by mosquitoes.